To submit news, a designer diary, outrageous rumors, or other material, please contact BGG News editor W. Eric Martin via email – wericmartin AT gmail.com. 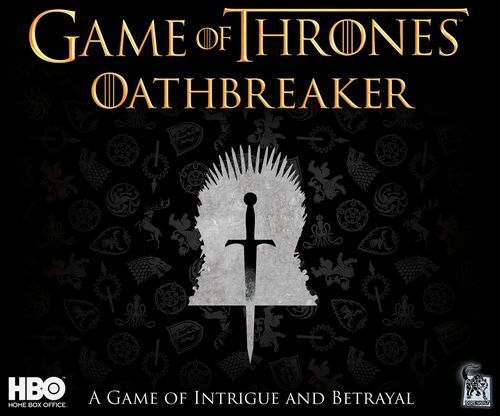 • Designer Mike Selinker announced in late March 2019 that for the past two years his company Lone Shark Games has been working with Justin Gary of Stone Blade Entertainment "on my first game with a traitor mechanic since Betrayal at House on the Hill". 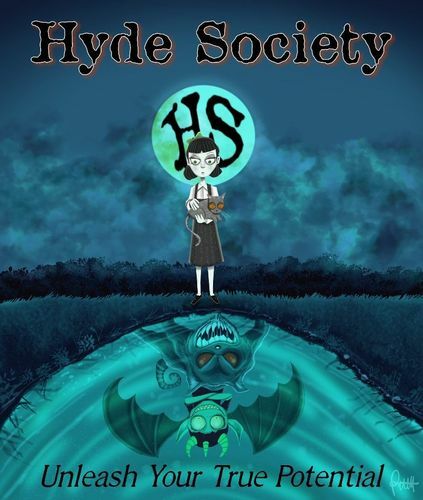 This game, tentatively called Hyde Society, is a fantasy game set during the Victorian era. Beyond that brief description, nothing else has been announced so far. • In June 2019, Z-Man Games will release a new edition of Seiji Kanai's Love Letter that contains five cards more than the original Love Letter — which might not sound like much, but since the original game has only sixteen cards, it will now be 31% larger! This 2019 edition of the game has all new art and two new characters: the Chancellor (value 6) allows you to draw two new cards, add those to your hand, then place two cards of your choice on the bottom of the deck, while the Spy (value 0) wins you a favor token if you were the only player to play or discard a spy during the round. 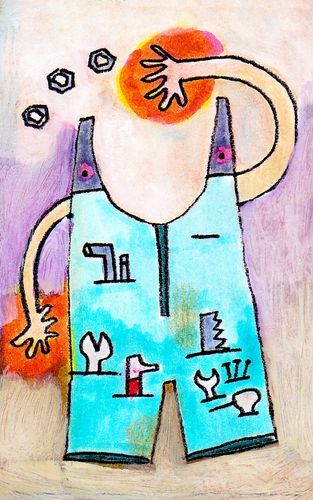 • CABO is a variant of the public domain card game Golf that designers Mandy Henning and Melissa Limes published through Eventide Games in 2010. 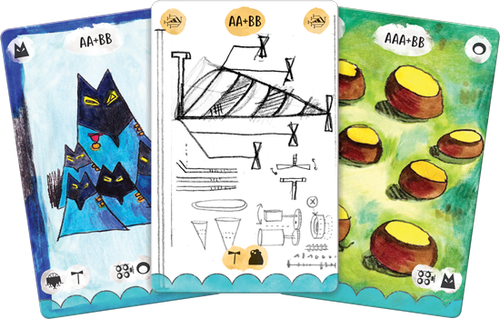 Now Bézier Games has released a second edition of CABO that keep the fundamentals of the game while changing some details of the gameplay and scoring. The gist of the game remains the same: Start with four face-down cards from a deck numbered 0-13, looking at two of those cards. On a turn, you can draw from the deck or discard pile, look at the card drawn (if from the deck), then decide whether to swap it for one of the cards in your display or use it for its special power (assuming that it has one). If you have matching cards in your display, you can remove them both and replace them with a single card, ideally lowering the total of the cards you hold. If you think you have the lowest total, you can call for the round to end at the start of your next turn, with you scoring no points if you're correct and scoring the sum of your cards and a penalty if you're wrong. Everyone else scores for their cards' value, and you play multiple rounds, trying to have the lowest score. Ragnarök is coming. The fate of all existence is at stake. Is destruction inevitable, or are there ways to avoid ultimate cataclysm? The Norns, mystical beings of great power, have decided they will not go quietly into oblivion and have turned their attention to the well of Fate, Urðr, in order to find any possible way to stop Ragnarök. Looking deep into the swirling waters, they can foresee which potential combination of heroes, villains, battles, victories, and defeats might stop the end of all that is known — but will they find the right combination in time? Is there any true path to salvation at all? They must hurry and seek the true way through, before all is lost. 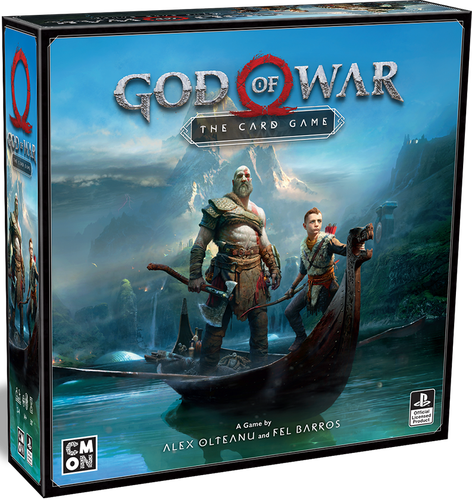 In God of War: The Card Game, players take on the role of the Norns as they try different combinations of heroes and events in order to stop Ragnarök. Each game is a new attempt to find the right key to saving Midgard from destruction. Players must work together, embodying mighty heroes such as Kratos, Mimir, Atreus, Brok and Sindri, and Freya. They will fight enemies and bosses from the popular God of War video game, but combined and remixed in exciting new ways, creating unique "What if...?" scenarios each time they play. If they succeed, the way forward has been secured and Ragnarök can be halted. Failure means the Norns will have to try again as only death and destruction lay along that particular path. Each quest in God of War: The Card Game is made up of a mosaic of cards that recreate monsters and locations from the video game. Each quest's mosaic is different, and each card is double-sided, depending on whether a section has been destroyed or not, and each has special rules that go into effect when it is face up on the tabletop. Learning how each quest is won, as well as what strategy to employ, is key to victory. As players progress, earlier quests have an effect on what comes after them. At certain points along their path, players must choose which quest they will complete. Completing one might grant a bonus, but quests left untouched result in dire permanent consequences as the players move forward. Heroes in the game have several elements that make them unique. Each comes with their own dashboard that explains their special abilities and health totals, in addition to tracking the number of cards a player can keep in their hand from round to round. Tokens are used to keep everything clear as heroes gain and lose health and build up their power so they can unleash a mighty special attack. 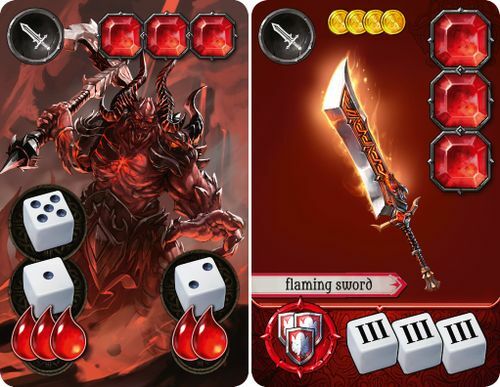 Heroes begin the game with a unique starting deck of cards that will be augmented from additional decks as the game progresses. Players can construct their deck to focus on their strengths or look for ways to generalize their approach, preparing for future quests that lie ahead. Each hero also has a unique standee that indicates which portion of the mosaic they are facing. With multiple heroes from which to choose, numerous ways to build their deck, and various different quests to attempt, each game of God of War: The Card Game will be a new experience that will echo throughout eternity. Echo throughout eternity? That sounds like a tall promise. Revered for its healing techniques, the town of Yharnam is rapidly degrading as a plague that turns people into beasts spreads uncontrollably. As a Hunter, it falls to you to quell this growing threat. You will have to fight through beasts, monsters, and townsfolk alike to survive the night and discover the source of this madness. 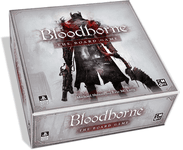 In the campaign-based action-adventure Bloodborne: The Board Game, players take on the role of Hunters, working together against the game to uncover the mysteries hidden within the city of Yharnam and beyond. Featuring unique Trick Weapons, each with various forms and powers, Hunters have to think quickly and adapt their tactics to overcome the multitude of foes that stand in their way. Learn their behavior, exploit their weaknesses, and strike them down! Featuring unique card-driven combat, luck has little place here — success or failure depends on your choices and how you approach each engagement! Of course, against such horrific foes, death is a common occurrence, but worry not as death is no end for a Hunter. Those who fall in combat awaken in the Hunter's Dream, ready to return fresh to the fight. Be warned, however, that upon awakening you might find previous foes and obstacles returned, Worse, time is not on your side as the Blood Moon rises ever higher into the sky, spreading its madness across Yharnam. You must press ever forward if you and your comrades hope to complete the Hunt before the city meets an unfortunate end. One topic I'd like to explore more in the future is the limited shelf life of games, which we touched on in this show following a distributor's comment that I saw. That comment mentioned that a game has a retail shelf life in the U.S. of only a few weeks — unless the game is great, in which case the game might last two or three months. The problem, of course, is that you often can't determine a game's greatness within such a limited time because the potential audience for it is unlikely to descend on the game store within that short window, play it, then spread awareness of the game to others before it's already been moved out of a distributor's catalog. Publishers have a tough job of spreading awareness of their game releases, and beyond that continuing to spread awareness of a design instead of simply dropping it in favor of next month's release. You're not going to develop evergreen titles in your catalog if you don't give them a chance to plant roots. 00:55 Tickets! Get your tickets for BGG.CON! 06:59 What Have You Been Playing? 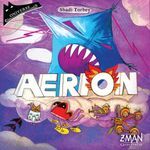 Aerion started with a simple (and rather mean) idea: Create a solo/two-player co-operative dice game in which you had to acquire resources by rolling different results (double pair, full house, street, etc…), but without getting any free re-rolls to improve the results of your dice. Instead, you'd have to pay for those re-rolls by discarding the very resources you were trying to acquire! 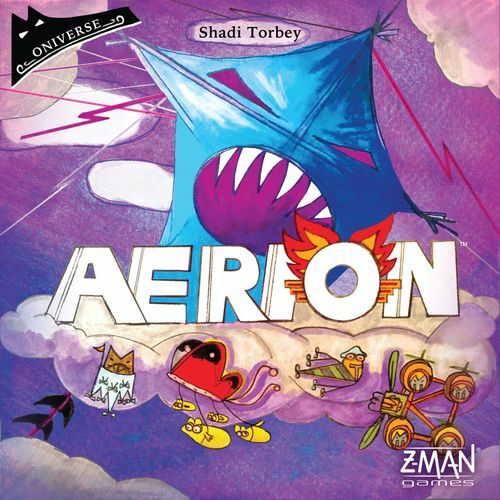 In Aerion, you are an air-shipwright tasked to build a new fleet of ships to traverse the skies of the Oniverse. The object of the game is to build six airships before your resources run out. You need three different resources (cards) for each ship: a blueprint to work off of, materials to build it, and a crew to fly it. You have to manage your resources carefully as you construct each ship: There are two different crew types (each crew can man three types of ship), three different material types (each material allows you to build two types of ship) and six different blueprints (each ship has a specific blueprint). You also have one more powerful asset that won't directly help you build ships, but does have multiple powerful effects: books. Book cards can be used to re-roll dice, recover discarded resources, or stockpile resources for later. With the right roll, you can acquire one of the six available cards in the display. If you need a different roll to acquire the card you want, you can discard cards from the display to re-roll. You can keep trying until you either acquire a card or burn through all the cards currently in the display trying! The display isn't refreshed with new cards until the end of your turn, so you need to work with what's in front of you. Discarding cards from the display doesn't just limit your options; it brings you closer to defeat. If all the cards run out before you complete your task, you lose the game! The airships take shape in your workshops, where you place the resources you've acquired. You can gather the materials and blueprints in any order you want, but your crews won't sit around waiting for the ship to be skyworthy, which means that you need to recruit them last once your ship is built (unless you have a game room, but more about that later). Note that you have only two workshops, so you won't be able to haphazardly accumulate resources that don't fit together. For an example, let's say that last turn you acquired the cocoon material card and put it into one of your two workshops. Now you roll the dice, and this is what you get: 2/2/5/5/3/6. What should you do? Your dice result has two pairs which lets you acquire the incubus crew, but you don't need it yet as you would have to get a fitting combination of blueprint and material in one of your workshops first — and so far you have only one material card (the previously acquired cocoon). If you could roll another 5 or 2, you could get the blueprint that goes with the cocoon you already have. Or if you could just roll a 4, you would have the series of sequential numbers necessary to acquire a different blueprint to put in your second workshop space. Or you could even try to get four of a kind to take the always useful book card. Now, which dice should you re-roll? And, more importantly, which card from the display should you discard to do so? From the start of the design process, it was clear that I did not want to have all the resource cards in one single deck since this could lead to cards being drawn in unwinnable or unfun combinations, so I separated the cards into several pre-determined mini-decks, based on the combination of dice needed to acquire these cards. As expected, this led to a much smoother and regular distribution of the cards into the display. Should we call this "deck management"? When designing Oniverse games, building the expansions is always a fun and stimulating challenge: How far can I push the game's core mechanism and add (or, in certain cases, remove) elements without the whole thing falling apart? Aerion includes six expansions to present new challenges for players to conquer. One of the first elements I wanted to explore was time. The game may put you in some excruciating situations, but it never really puts you under time pressure. If the dice don't seem to go your way, you can often adapt by getting another card than the one you were aiming for, then trying again later. None of this with The Hourglasses expansion! Now you must also acquire the six hourglass cards that remain on the display for only one turn! 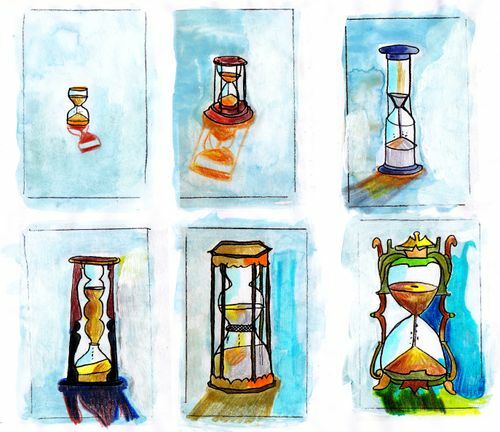 The Hourglass expansion elicited its mirror concept: What about cards that you would like to keep in the display as long as possible? 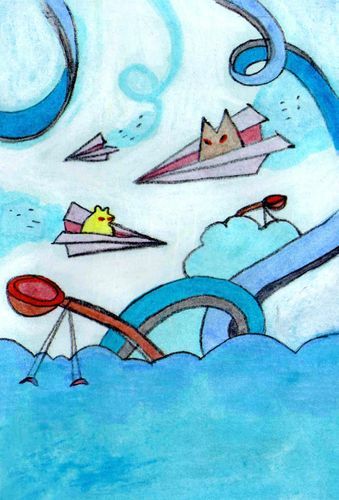 This led to The Stone Clouds expansion: Clouds (in the form of tokens) block the skies, and you have to get rid of them! To help you, you have the faithful hammer birds, but these bird cards cannot be acquired, only discarded, either to improve your rolls (so, basically, more free re-rolls here) or to destroy the stone clouds. 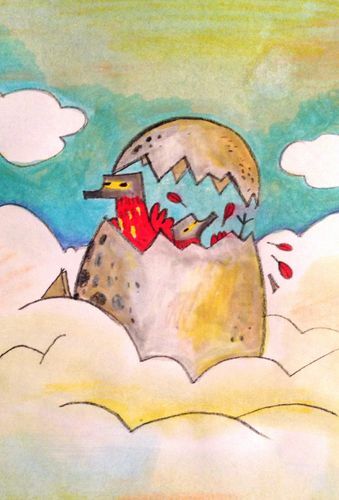 And here's the twist: The more hammer birds you use, the more stone clouds you can destroy — exponentially! But how long are you able to play around those bird cards without discarding them for a tempting re-roll? Expanding: Highs, Lows, and the Villain! Aerion's base game presents the player with this fundamental dilemma: Which card should I try to acquire, and which cards can I afford to discard for re-rolls to make that happen? The Stone Clouds expansion introduced an incentive for keeping cards in the display until you had multiple copies available, but I wanted to try a different twist on this dynamic as well: What about a card that you could discard for a more powerful re-roll, but with a cost? The workers featured in The Piers expansion can work overtime to give you three re-rolls instead of one when you discard them, but you must give them their payday later in the game with a roll totaling 26 or more. The workers come with their own additional challenge: Building the piers necessary to properly launch the airships you've built. The Piers expansion (and, to some extent, The Stone Clouds expansion) make high rolls valuable. But one quality I've always admired in dice games is finding ways to make low rolls useful in their own way. In Aerion, your low rolls can be used for one of the most difficult tasks of all: Hunting our newest villain, The Hellkite! This vicious predator of the skies lurks in far-flung outposts, preventing you from acquiring the card type shown on the outpost where he currently sits. Fleeing from your hunt to lairs packed with the plunder of past raids, the Hellkite must then be confronted in the heart of his domain where you can reclaim stolen resources and liberate captured crews. When designing expansions, I always aim to ensure that they are fun to play in any combination — including all of them at once! Playing with the workers, hammer birds, and hourglasses together almost doubles the card count in each deck, so a bit of judicious deck manipulation was in order. Plus, there was another facet of the design I still wanted to explore: cards that could never be discarded from the display (in contrast to all other cards of the game, which can always serve as re-roll fodder). Your friends, the hammer birds, have now laid Eggs all around. You have to retrieve them, being careful not to break a single one! Egg cards can never be discarded (on pain of losing the game! ), but once acquired, you can use them to look at top cards of a deck, allowing you to chose a better card to put on the display. You can even do that after a dice roll to try to adapt the display to your roll! Once I established a core concept and a series of variations on the central theme, it was time to throw all of that out the window and let players cheat! The obligation to put acquired cards into the workshops? Gone! (Well, almost.) Now you have a seventh ship to build: The Flagship, which serves as its own workshop and blueprint. All you have to do is gather one copy of each material and of each crew. This additional ship clearly makes the game harder, so players get two cards that let them bend the rules a bit: the factory cards. Each factory card gives you new capabilities that let you break some of the core rules of the game. No free re-rolls? The geniuses down in the Research Lab can shake that up! You must continue to discard cards until you can acquire something? The Security Department can put a stop to that! The crew has to be added last? Not if you can keep them entertained in the Game Room! Final Destination, or the First Step of a Journey? With six expansions (each with an optional difficulty setting), one could think that I explored all aspects of this "deck management" system. I actually had just got started. The next idea: What about getting rid of the dice altogether? 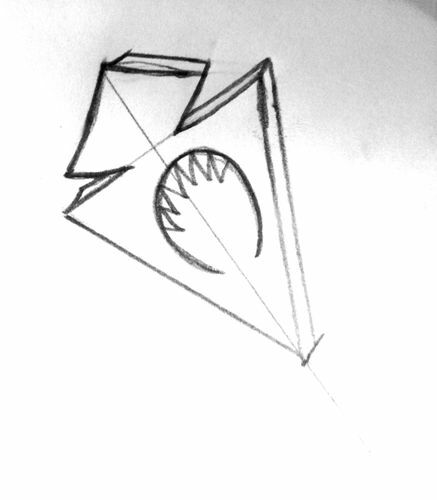 But this led to another chapter in the Oniverse and may (hopefully) be the subject of another diary someday. For now, the skies are waiting! Grab your dice and build some airships! 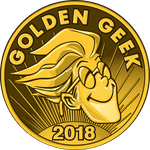 This marks the fifth year in a row in which Renegade Game Studios has landed a Mensa Select award, following Lanterns (2015), World's Fair 1893 (2016), Clank! : A Deck-Building Adventure (2017) and Ex Libris and Raiders of the North Sea (2018). Blue Orange Games won the award in 2018 for Photosynthesis, with an earlier win in 2016 for New York 1901. Game publishers submit titles to the Mensa Mind Games event, paying a fee in the process in addition to giving copies of the games to the organizing Mensa branch for use during the event. The 2020 Mensa Mind Games will be hosted by the North Texas Mensa chapter. In 1871, the Treaty of Versailles was signed between France and the newly established German Empire, badly shaking the balance of power that had kept Europe relatively stable since Napoleon's defeat in 1815. France longed for revenge against Germany, as did Austria-Hungary, yet the weakening Ottoman Empire seemed a much easier target for recovering the honor she had so recently lost to the ascendant Germans. Meanwhile, Russia longed to see the subject peoples of the Balkans take refuge under her wings, and every attempt by a European power to spread her influence into the Sick Man of Europe was watched with grave concern by all. Russia, with its huge army, was also being closely monitored by Britain in central Asia, where the latter wondered what schemes this eastern giant might have planned. Did Russia have intentions towards Britain's treasure of India? And was this new German Empire friend or foe? Would she attempt the herculean task of building a large navy to rival Britain's? As her chancellor, Bernhard von Bülow, said a quarter century later, "We wish to throw no one into the shade, but we demand our own place in the sun." This struggle for a place in the sun would ultimately lead to the catastrophe of World War One, drawing all five powers into its maelstrom and destroying three of them in the process. Our Place in the Sun portrays the rising tensions and dwindling war fuse that burned among the European powers from 1871 until the time of the First World War — yet a world war is not necessarily your objective. Your goal is simple: Outrank your rivals in national honor with or without the Great War breaking out. To do so, you must spread your influence into the four areas over which the European powers were quarreling during this time: the declining Ottoman Empire, central Asia, the Far East, and Africa. You must also build sizable armies and navies in the event that war does break out. If you are leading in national honor, then this might be the right opportunity for you to initiate the catastrophic conflagration. But if your ambitious schemes isolate you diplomatically, you just might find yourself friendless when war begins and witness the collapse of your empire. Perhaps you should play the honest broker and try to prevent the Great War. Have you the wisdom of a Bismarck, or the incompetence of a Kaiser Wilhelm II? Our Place in the Sun is a card-driven game inspired by the award-winning two-player game Twilight Struggle, but playable with up to five players. 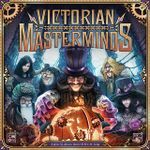 Given the radically different settings of the two games, you will find familiar mechanisms considerably transformed, along with completely new ones, too. Naturally, the events portrayed on the cards are different: the German Fleet Acts, the Boer War, the Boxer Rebellion, the founding of the Indian National Congress, and the assassination of Archduke Franz Ferdinand are all here, as well as many, many more. Players can even form alliances and host European Congresses to both lessen tensions and deal with matters they'd very much like to avoid. Our Place in the Sun can be played in a variety of ways. Given that new players will have no familiarity with the cards, each turn can be played as a one turn mini-game simply to familiarize themselves with the cards available for that turn. (For novices, such a game might take a little more than an hour.) Once players are comfortable with the cards for the first two turns, they may want to try a two-turn game consisting of turns one and two; and when turn three is mastered, a three-turn game, and so on. With experienced players of Our Place in the Sun, a full five-turn campaign game can be anticipated to last from three to three-and-a-half hours. The five-turn game will last much longer for players who don't know the cards! Alternatively, players may play a multi-turn game beginning on a turn other than turn one; two shorter one-region scenarios are available as well. • Here's an odd "Inside Baseball" item for you: German publisher AMIGO has changed the name of Haim Shafir's Klack!, which debuted in 2012, to Clack! In a press release announcing the change, AMIGO notes that the English-language version of the game — which uses the "Clack!" title — has been the best selling title in the line-up of the U.S.-based Amigo Games Inc. Says spokesperson Andrea Milke in my translation, "This led us to secure the worldwide rights to a single title so that 'Clack!' could be established as an international brand." Catan has already gone this route, of course, and now this real-time game of magnetic disc-grabbing — previously available under the names "Clac Clac", "Crazy Clack! ", "Cvak! ", "Halli Klack! ", and "Klik! — is following suit. 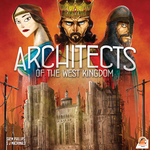 • Asmodee France, which distributes titles for Libellud, tweeted in April 2019 that Seasons: Enchanted Kingdom and Seasons: Path of Destiny will return to print in mid-2019. • French publisher Igiari released a new edition of Stefan Dorra's Intrigue in 2016 — preview video from Spielwarenmesse 2016 here! 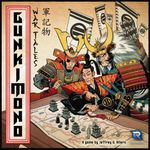 — and the company now reports that it's been picked up by Asmodee North America for release in English, by Mandoo Games for a Korean edition, and Swan Panasia for a Chinese edition. • Milito from Martin Wallace and PSC Games is a revamped version of Field of Glory: The Card Game, which Wallace has self-published in 2013. While that earlier two-player game pitted a generic red army against a generic blue army, Milito features six historically based armies: Imperial Roman, Ancient British, Carthaginian, Republican Roman, Alexandrian Macedonian, and Achaemenid Persian. A Kickstarter campaign to fund the game, um, ended the day before this post went live (KS link), but the game is due to backers in June 2019, so it will be available soon enough in any case. (And should you, by chance, be in the market for an Italian edition of Milito, Giochistarter doesn't start funding its campaign (link) until May 17, 2019. Sei fortunato! Vampire: The Masquerade – Blood Feud is a highly thematic, team-based, strategic game that plays 4-32 players and is run by 1-2 storytellers who also interact and play. You may play as one of the warring vampire clans such as Ventrue, Tremere, Gangrel, or Toreador, or perhaps you'll chaoose to become one of the human factions fighting for their own desires, such as City Hall, the Mafia, or the Arcanum, with many more from which to choose. Additionally, the game integrates the story world of Vampire: The Masquerade by adding storyteller scenarios that add an optional narrative approach to the game. Players also gain disciplines, which give them powerful supernatural abilities unique to their character. Lastly, teams will choose their ambitions, which allow for multiple paths to victory, such as being bloodthirsty, manipulative, greedy, or somewhere in between. 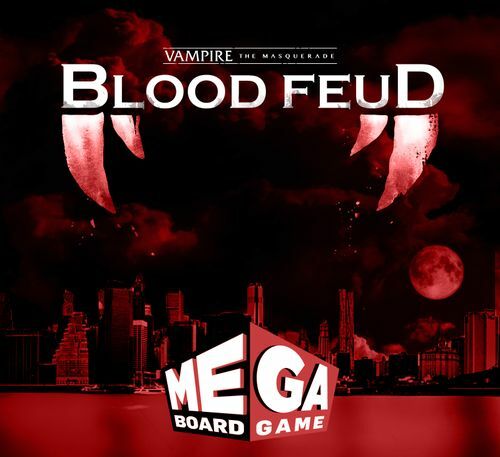 Blood Feud is dubbed a "Mega Board Game" because unlike a traditional board game, it isn't played at a single table. Blood Feud requires a large room or two separate rooms with 2-4 tables. One game table features the Cityscape and Orders, the map where players move their forces around the city and order them to fight and take control of important territories. The other game table features the Council and Market, where players use their best diplomatic and resource management skills to make sly trades, buy upgrades and player level-ups, and make large political decisions that will shape the destinies of teams to determine whether they win or lose! In order to win the game, teams earn victory points through the completion of legacies, which are secret objectives that can consist of all sorts of tasks and achievements earned through gameplay. In this culmination of the Hostage Negotiator series, you will play ten years in the life of a negotiator — that is, if you don't retire in shame sooner. In each "year" or campaign round of the game, you will resolve a career card that presents you with some narrative event that relates to or could impact your career based on the choice you make. Then, in most but not all years, you will be called to the scene of the latest hostage situation. Now, the result of each negotiation will impact the overall campaign and you'll be tracking your career stress, your personal stress, your merit level (for promotions), and your rank, among other things. After the negotiation, you resolve a personal card and are once again faced with a narrative event to resolve and, based on the result of your negotiation in that "year", will be rewarded (or reprimanded) accordingly. Hostage Negotiator: Career will hit Kickstarter on April 30, 2019 along with — how convenient is this? — two new Abductor Packs to bring the total number of such packs available to ten, one for each year of your career. Playing on a famous horror movie trope, Final Girl is a solitaire-only game that puts the player in the shoes of a female protagonist who must kill the slasher if she wants to survive. In game terms, Final Girl shares similarities with Hostage Negotiator, but with some key differences that change it up, including a game board to track locations and character movement. You can choose from multiple characters when picking someone to play and multiple killers when picking someone to play against. Killers and locations each have their own specific terror cards that will be shuffled together to create a unique experience with various combinations of scenarios for you to play! 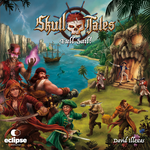 • Finally, starting in mid-2019, Van Ryder Games will have copies of the semi-co-operative game Skull Tales: Full Sail! 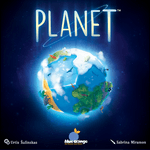 from designer David Illescas and publisher Eclipse Editorial, as well as the game's expansion, for sale at conventions. Interesting to see limited distribution deals like these come about, and limited distribution is almost always better than no distribution at all! • April is the second-slowest month for game announcements — December being the slowest — so I find myself with time to catch up on some of the notes that I've sent myself since the beginning of the year, time to clear out a few dozen tabs that have been lingering on my browser, awaiting a return trip by my eyeballs. The Neo-Babylonian empire, especially under the reign of Nebuchadnezzar II (605-562 B.C. ), was a period of rebirth for southern Mesopotamia. Irrigation systems improved and expanded, increasing agricultural production. Urban life flourished with the creation of new cities, monuments and temples, and the consequent increase in trade. 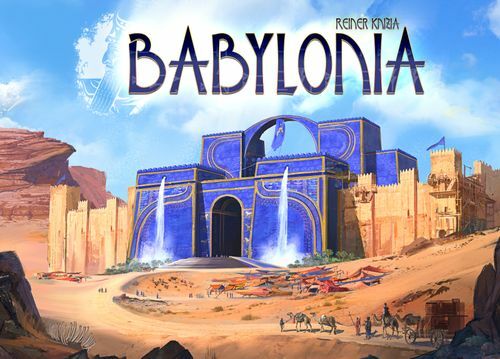 In Babylonia, you try to make your clan prosper under the peace and imperial power of that era. You have to place your nobles, priests, and craftsmen tokens on the map to make your relations with the cities as profitable as possible. Properly placing these counters next to the court also allows you to gain the special power of some rulers. Finally, the good use of your peasants in the fertile areas gives more value to your crops. The player who gets the most points through all these actions wins. If you're like me, you might be left saying, "That's cool and well, but what's the game like?" Thankfully Spanish gamer Javi Santos offered this briefing in the game's forum: "It is a tile lying game which may remind us about Samurai, but it is quite different. In this game it is very important to make chains with your tiles, and scoring is continuous, instead of scoring just at the end. Very tense, with this great feeling of always having too many things to do, which of course you cannot do all." 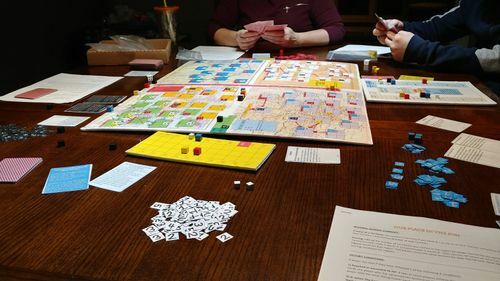 • While looking into the new edition of 10 Days in the USA, as covered in this March 2019 post, I ran across Korean publisher Popcorn Games, which was previously unknown to me. Turns out that the company was originally an online retailer called "Popcornedu" that moved into publishing in 2017 in order to sell its own games in addition to the games of others. Popcorn Games has licensed most of NSV's line from the past few years (The Mind, Qwixx, etc. 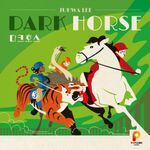 ), but it's releasing other titles as well, such as a new version of Juhwa Lee's betting game Dark Horse, which debuted in 2014 from Korean publisher Magpie Games, then was licensed by Bombyx and Moonster Games for release as Minuscule. 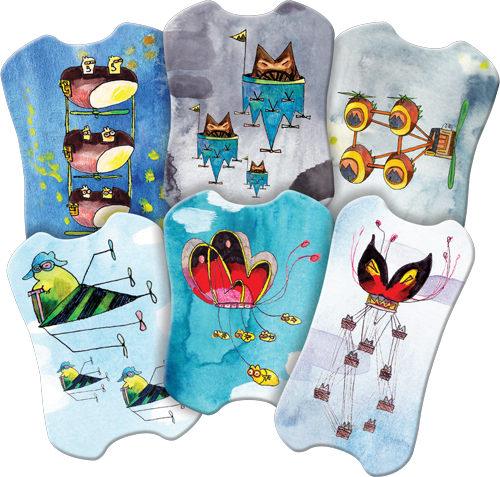 Each player has a hand of seven cards, with each card showing a situation on the bottom — cat attack, ice cream sale, etc. — and the resolution of a different situation on the top. You flip over one card in the center of play, then everyone races to resolve that problem by playing the correct card, which then presents a different situation that needs resolving. Zoom bang boom, empty your hand first to win. • While this item is only a prototype, it caught my eye, so I thought I'd include it anyway. 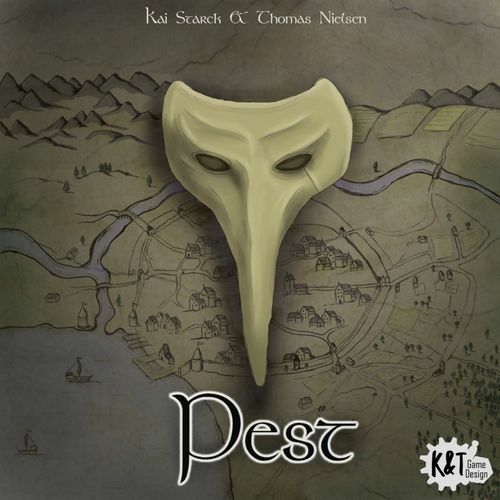 Pest is a design from Kai Starck and Thomas Nielsen in which players are princes during the Middle Ages who oversee the discovery of new landscapes and the construction of buildings despite the constant threat of plague, which complicates their ability to procure resources for various projects, in addition to, you know, killing off their residents. As such, controlling the plague is another part of their responsibility during gameplay. Sanctum, once a great city, is now the last beacon of light in a world shrouded in darkness. The lands surrounding the city are home to the demon horde lead by the Lord of Demons. It's up to a handful of heroes to rise up, battle through the horde, banish the evil that plagues the world, and restore the realm to its former glory. 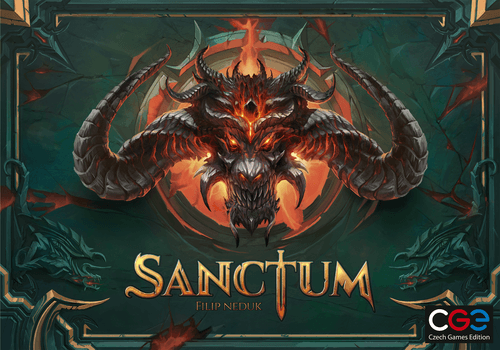 Sanctum is an epic adventure game for 2-4 players that's inspired by the hack & slash genre and converted into a modern board game. As one of the heroes, you embark upon a quest to rid the land of a demonic invasion, fighting your way through countless enemies and gearing up to face the Lord of Demons himself. In the process of venturing deeper into the land, ever so much closer to the Demon Lord, the heroes have to improve their equipment and adapt their combat tactics to face the increasing difficulty of combat. Each monster card has an item on the reverse side; defeat it to claim it! An incredible discovery has been made that will change the world forever. High in the snow-capped mountains, explorers have come across a number of large, colorful dragon eggs! Now the whole world is clamoring to get their hands on what's inside. It's a good time to get into the egg-hatching business! In Incubation, 2-5 players take on the role of entrepreneurial dragon breeders looking to make a fortune by collecting the required resources and feeding them into their special dragon egg incubators to hatch them. There are four different types of dragons, as well as hybrid and mystery eggs. As the dragons begin to emerge from their eggs, players can use them to fulfill objective cards, which earns them coins. The breeder who has earned the most coins through hatched dragon eggs, completed objectives, and collected tokens wins! Set in the titular city in the 16th century, Venice lets players take the role of wealthy, influential merchants as they ride their gondolas up and down the city's canals, train their assistants, complete contracts, and leverage their influence to gain political power. But business is anything but usual. As they broker contracts and flirt with crime, merchants must avoid arousing the suspicion of the Venetian Inquisition, lest they find themselves arrested and their businesses shut down. In the game, players move their two gondolas around the board. When they move a gondola, they may activate the assistants they have placed previously on any building they pass, but they may train (and improve the capabilities of) only the one on which they end their movement. Assistants allow you to gain resources, trade, make money, and take an array of other actions depending on the buildings to which they are assigned. When resources are made, they are placed in the gondola, and these will be used to fulfill lucrative contracts. Space is limited on the city's canals, however, and each time you pass another merchant's boat, gossip will spread, raising your suspicion level with the Inquisition. Lower your suspicion with visits and donations to the church, or academic institutions — or throw caution to the wind and engage in unsavory activities for money or information. During the game, being such a well-known merchant can be a boon to your political career, but at game end, the most suspicious player will be made an example of by the Inquisition — blocking your victory even if you have the most points. • Twilight Creations is taking an unusual approach with Zombies!!! Sin City, the next title in its long-lived — some might say undying — Zombies!!! game line. The game is being funded on Kickstarter and has already reached its $10K goal (KS link), and the publisher includes a list of components that will be in the box, but what you'll do with those components is not yet known. From the KS description: "This next installment of Zombies!!! is a bit different than anything we've done before. The game requires players to complete mini games in order to be able to leave Vegas and win the game. The mini games will be created by YOU!" Yes, you can pledge for a tier that lets you design a game tile, name a casino, or submit a mini-game to be included in the box. Who do you trust? If you sit on the Iron Throne, the wisest answer is "no one". In the game, one player assumes the role of King (or Queen), while the others represent the great Lords and Ladies of the Houses of Westeros. Some are loyalists who want order in the realm, others are conspirators who seek to undermine the throne, and all of them have a secret agenda of their own. Who is truly loyal, and who is simply hungry for power, honor, and coin? It's up to the King to figure it out before it's too late. In more detail, the game lasts seven rounds. In each round, players reveal a number of mission cards, each on which has an associated influence type: crowns, ravens, or swords. Each noble plays influence cards face down to one or more missions and places their House Sigil at the mission where they played the most cards. Then each mission is resolved by shuffling the influence cards there and tallying up successes and failures. If a mission succeeds, Order is generated; otherwise Chaos is generated. Nobles earn rewards (coin, honor, power) based on whether the mission with their House Sigil succeeded or failed. The King can play decree cards during the game to grant favor to nobles who seem loyal, or cast suspicion on suspected conspirators. Decree cards award Order if the King was correct and Chaos if the King was wrong. At the end of the game, if Order exceeds Chaos, the King wins and any loyalists who achieved their personal ambitions win. If Chaos has the edge, then any conspirators who achieved their personal ambitions win.